Party and event photography: Should you really cut corners and do it yourself? With the low entry level cost of digital photography, many companies and organizations want to cut costs and just buy inexpensive point-and-shoot cameras so they can make their own images from events, avoiding the expense of hiring a professional photographer to create graphically appealing and dynamic images from the event. Are you really doing the right thing for your business — or for your clients? We see many advertising, event planning, and public relations agencies sending their untrained employees out with automatic digital cameras to capture images. You won’t see red-eye from improperly placed flashes. The photos are in focus (that’s because we take the time to focus the camera manually, not relying on the automatic features that often fool a point-and-shoot camera. JSPRAA 2011 Beach Party.Our images are exposed properly, they are sharply focused, they show pleasing casual or formal poses. The colors are correct, the lighting is great. There are thousands of professional photographers out there who can do this, but you need to hire them if you want to improve your image. You will not build a great brand image by cutting corners and stuffing a cheap camera in your pocket — or your intern’s pocket — for important company and client events. 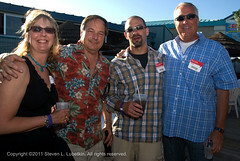 Take a hard look at the pictures your staff is bringing back from your events with your customers or client companies. Are you getting the same quality as our event photographs, or are your pictures running the gamut from barely acceptable to really awful? Ask yourself if you are you really saving money or if your efforts to make your own images are just damaging your company’s reputation?